O. Shchyglo, T. Hammerschmidt, M. Čák, R. Drautz, I. Steinbach. Gibbs energies: (a) α-Fe without chemomechanical coupling, (b) α"-Fe reference configuration and (c) α-Fe considering chemomechanical coupling effect. The difference between the curves (a) and (c) indicates significant phase stability change if chemomechanical coupling effect is considered. In this study we propose a unified multi-scale chemo-mechanical description of the BCT (Body-Centered Tetragonal) to BCC (Body-Centered Cubic) order-disorder transition in martensitic steel by adding the mechanical degrees of freedom to the standard CALPHAD (CALculation of PHAse Diagrams) type Gibbs energy description. The model takes into account external strain, the effect of carbon composition on the lattice parameter and elastic moduli. 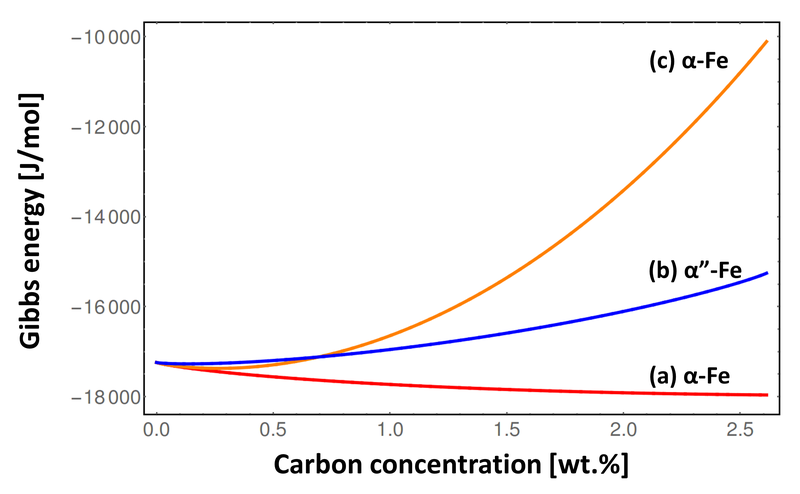 The carbon composition effect on the lattice parameters and elastic constants is described by a sublattice model with properties obtained from DFT (Density Functional Theory) calculations; the temperature dependence of the elasticity parameters is estimated from available experimental data. This formalism is crucial for studying the kinetics of martensite tempering in realistic microstructures. The obtained extended Gibbs energy description opens the way to phase-field simulations of tempering of martensitic steel comprising microstructure evolution, carbon diffusion and lattice symmetry change due to the ordering/disordering of carbon atoms under multiaxial load.